This week’s MotoringExposure article on watches is about Omega’s Speedmaster Missions case. There is one (#34) up for sale on eBay for $145,000.- USD and as this is a very rare occasion, I thought it might be well worth blogging about. Of the 50 cases produced in total (in three batches of 40 and another 5 in 1997 and yet another 5 in 1998), this Missions case belongs to the first batch. 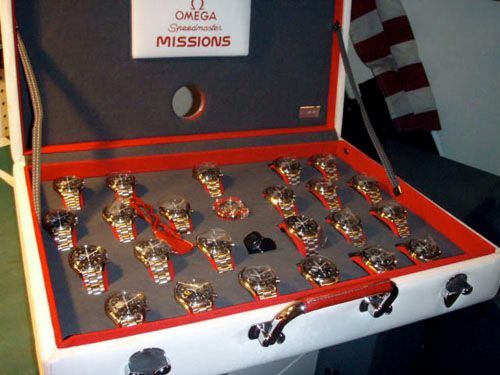 These cases consist of 22 Speedmaster Mission models (with NASA mission patch at 9 o’clock) and 1 Speedmaster Replica to honor the first Speedmaster CK2915 of 1957. So, in total, $145K USD will bring you 23 timepieces, a loupe, a spare caliber 1861 movement and a nice case. Click here to go to my more in-depth article on the Speedmaster Missions cases over at MotoringExposure.